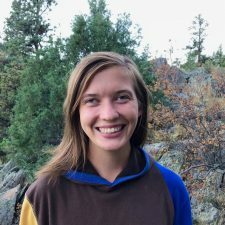 Amelia was born and raised in Las Vegas, N.M. After graduating from Eagle Rock School, Amelia attended Antioch College in Yellow Springs, Ohio. There, she designed and completed her Bachelor of Arts degree in Ecological Praxis in Healing — a multidisciplinary degree that explored environmental science, anthropology, philosophy, and psychology. During her college years, Amelia’s non-academic activities included creating a campus herb garden and community apothecary, writing for the campus newspaper, attending a weekly reading/writing group called “Women Empowering Women” at the local women’s prison, working in the kitchens, and becoming a yoga instructor. In choosing to return to Eagle Rock as a fellow, Amelia said she is excited to build on student interests and to be an advocate of their growth and empowerment. In a nutshell, Amelia loves to laugh, cook, and eat good food with loved ones, travel, read, garden, build things, make art, cry at beautiful things, and stay physically active. Amelia is the fourth Eagle Rock School graduate to return as a fellow. I really love cooking breakfast foods.